Individuals who are referred for Goodwill’s Employment Services become part of a pool of qualified job candidates available for area employers. Job Coaches are available to assist them, their co-workers and employers as they begin a job. Goodwill works to match an individual's skills and interests with the needs and expectations of an employer. Employers benefit from hiring individuals from this group of qualified job candidates because they have been carefully screened and come with training and on-the-job support from Goodwill staff. Individuals with disabilities are a dedicated and enthusiastic workforce, which results in reduced turnover and high quality work for employers. 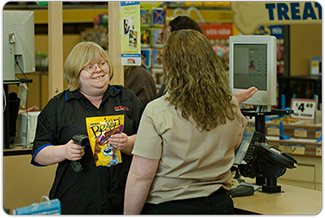 Goodwill can also provide employers with assessments and recommendations specific to the Americans with Disabilities Act (ADA), job analysis, and on-the-job training. In addition, employers who hire Goodwill candidates may be eligible for Work Opportunity Tax Credits.